Everyone’s favourite clown fish, Nemo, from Finding Nemo is super cute but that’s not the reason why mum-to-be, Tayler Borre, included him in a recent baby bump photo. It turns out her unborn daughter will have something in common with the adorable character, and her story is now warming hearts everywhere. 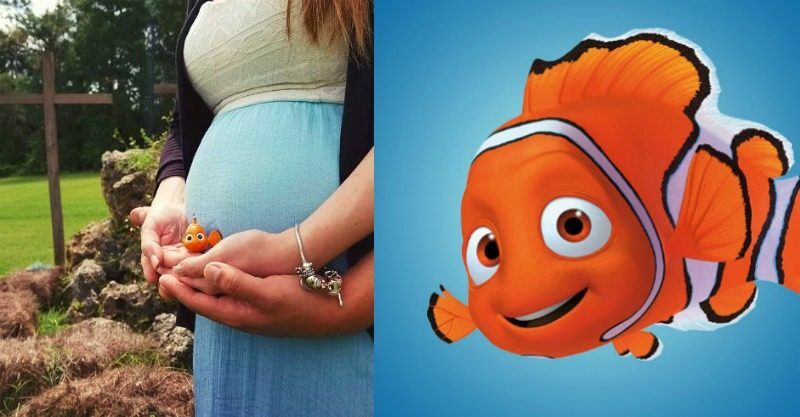 “To most people they will see this and think oh a cute pregnancy picture with their favorite Disney character Nemo! But to my family this means so much more than just a picture…” said Tayler Borre in a heartfelt Facebook post this week, which showed her and her partner Ryan’s arms cradling her beautiful bump along with a replica of the iconic fish. You see, it was during an anatomy ultrasound that doctors discovered Tayler Borre’s unborn daughter has amniotic band syndrome (ABS) – a condition where the baby becomes tangled in fibrous amniotic bands in the womb which then restricts blood flow and affects their development or amputates the body part they wrap around. As a result, Tayler’s baby girl will be born with no left hand, but just like Nemo with his ‘lucky fin,’ she is perfectly healthy in every other way. Initially the news was very hard for Tayler to hear as she thought about how mean people can be towards others who are different, but she soon felt at peace and embraced the fact her daughter would have a limb difference. Tayler has been receiving support from an organisation called Lucky Fin Project which was set up to help parents of children with limb differences. In sharing her story and photo on Facebook she was hoping to build more awareness for ABS and let parents of children with the condition know they’re not alone. “Feel free to share, I have it public. I want people to be aware of ABS and other parents of ABS to know they’re not alone!” Tayler signed off in her post. People have responded to the touching photo in droves with the post already shared over 62,000 times. Even more likes and comments have come from friends and strangers all over the world, offering words of kindness and support for the Borre family – including other parents of children with their own little lucky fins who have proven that being different is no barrier whatsoever for kids. We wish Tayler’s family all the best and know her little girl will be awesome no matter what!